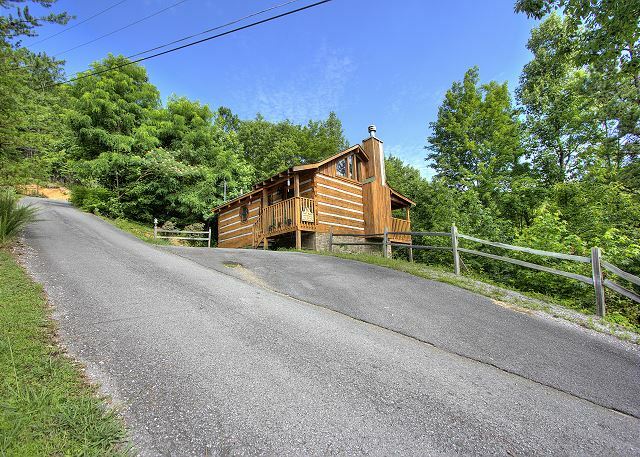 Always Misbehavin is a one bedroom, one bath cabin with mountain views from the hot tub, a heart shaped jacuzzi tub, pool table and seclusion,... VIEW NOW. 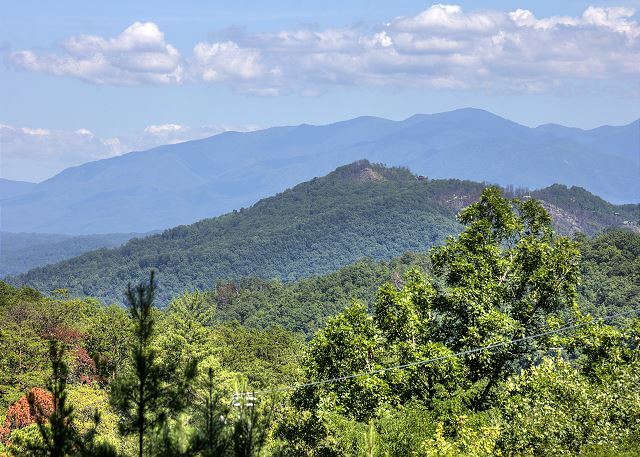 Location: Pigeon Forge, TN (Bluff Mountain) Great Views! 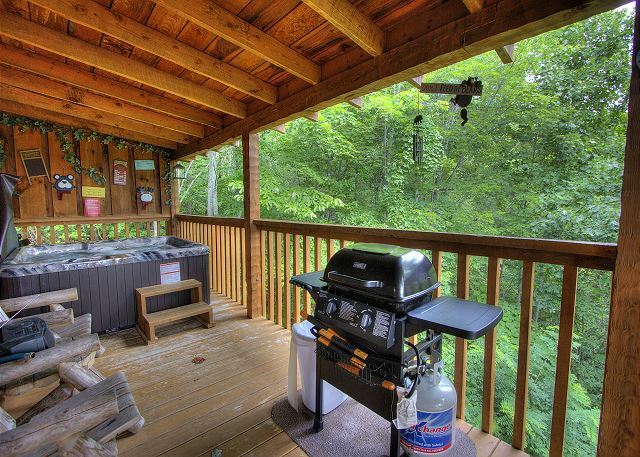 Stay in one of the few private, but great view romantic getaway cabins in the Smokies! 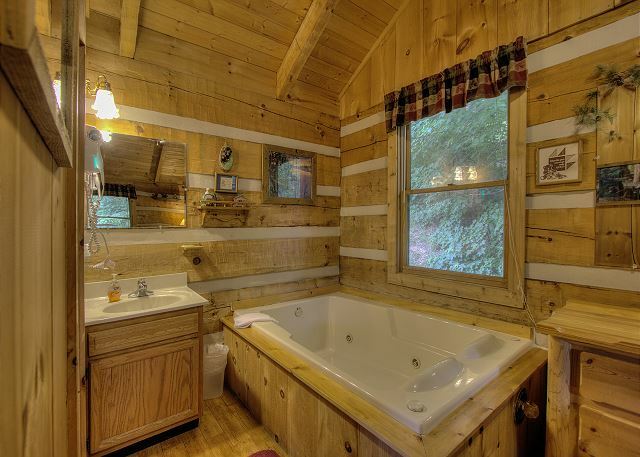 This cabin is just 7 miles from Pigeon Forge. 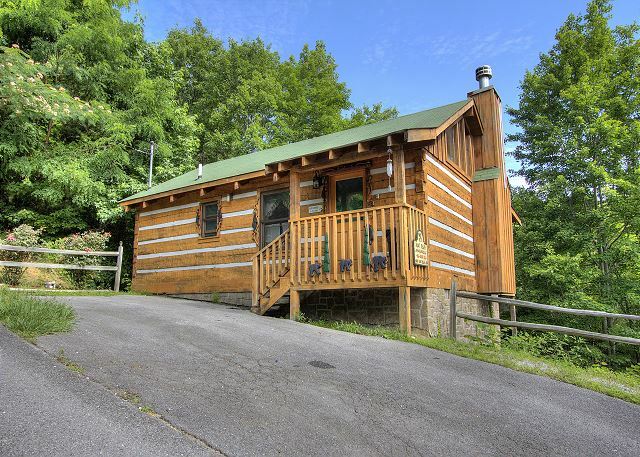 Come relax in this cute, private one bedroom, one bath log cabin located off in Pigeon Forge with a Great View of the Smoky Mountains! 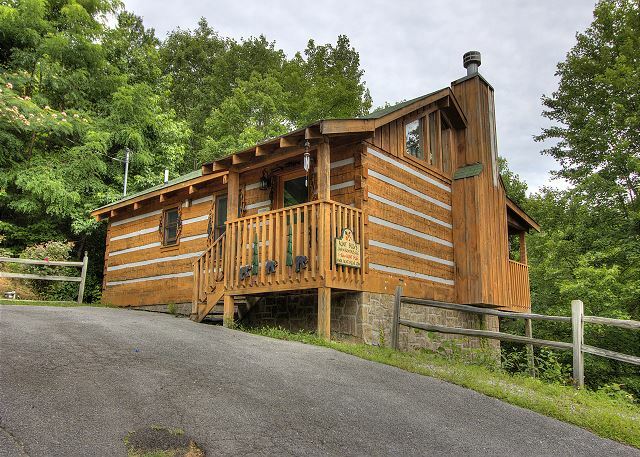 This Private log cabin has everything you need for the perfect honeymoon or weekend in the Smokies! 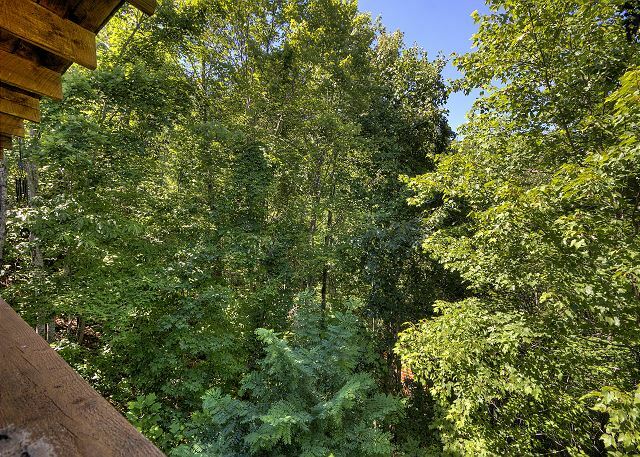 Apple Bear View is nestled on a hillside, yet close to all the attractions. 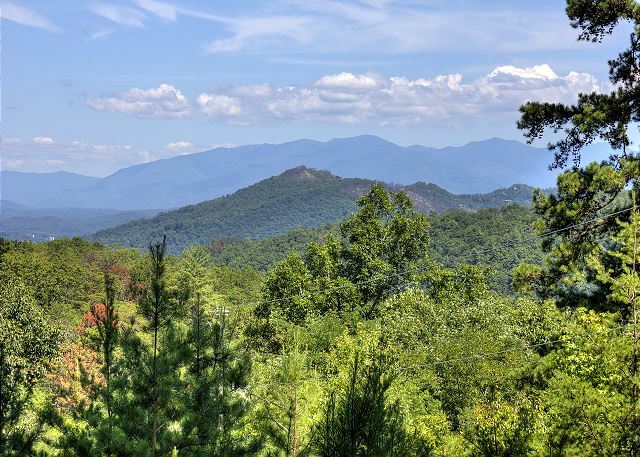 Enjoy the beautiful mountain views from the double porch swing or soak up the scenery in your private, NEW covered Hot Tub.The fully equipped kitchen has everything you need to prepare dinner or you can throw some steaks on the gas grill. 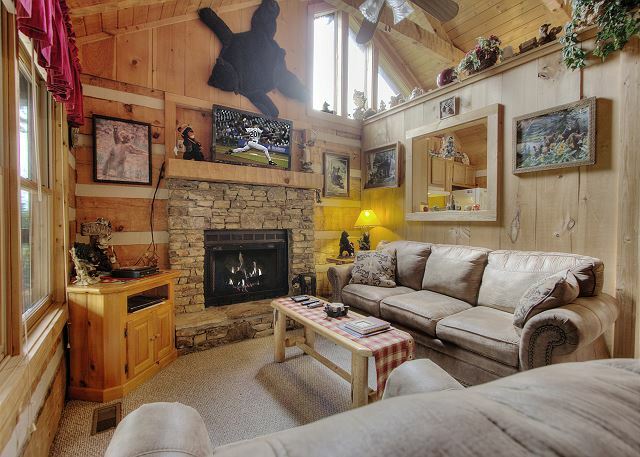 There is a queen sleeper sofa, a 42 inch Flat Screen TV with DVD player in the living room located above the Stacked Stone gas fireplace. 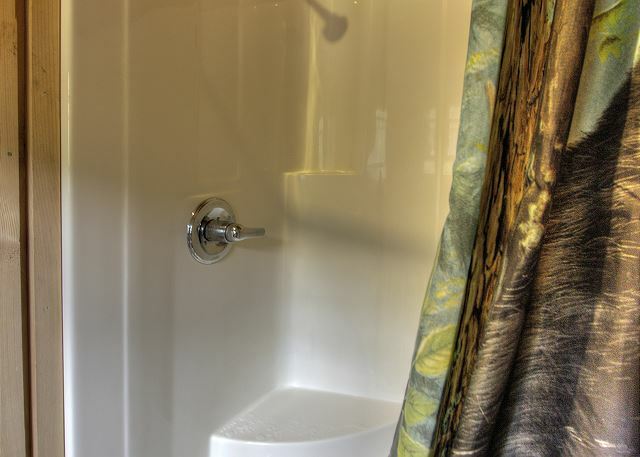 The master suite has a king size Log bed, a 32" Flat Screen TV and a Jacuzzi tub in the full size master bathroom. There is a washer/dryer for your convenience. You'll love the privacy and location. So look no further, book Apple Bear View today! Rate is for 2 adults. Each additional person is just $12.50 nightly. No smoking please. We had a great time and enjoyed the cabin very much! cabin was clean. 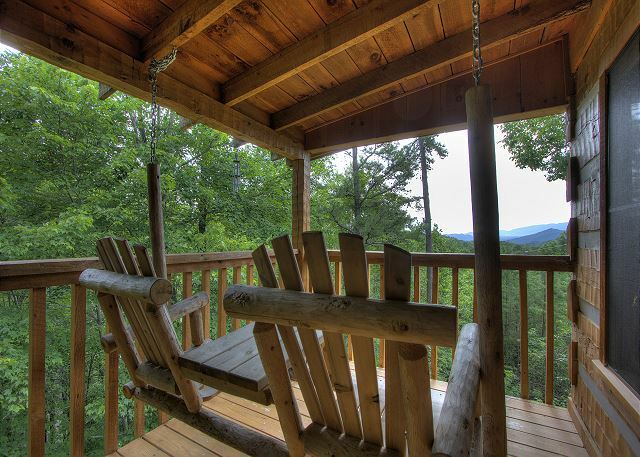 We loved the porch swing that has a great view of the mountains. The outside Jacuzzi was awesome. Close by to the downtown area. As soon as we walked in our cabin I was so pleased! 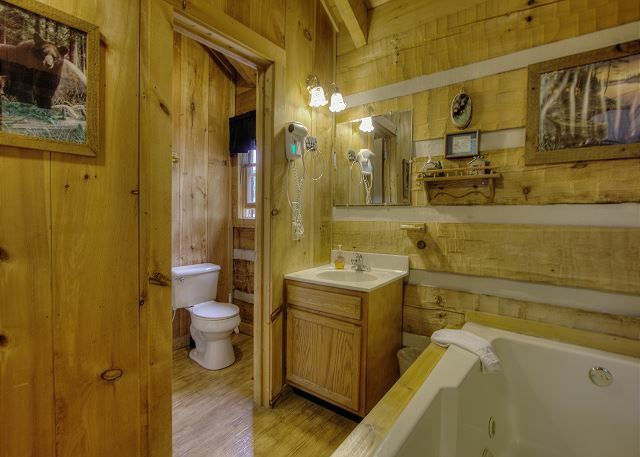 It smelled fresh and every room was very clean, I would recommend this cabin for a couple . It was private and very romantic . Honestly we stayed in the cabin more than going out . I would love to come back every year ! We loved it. The view was breathe taking. We arrived exhausted and needed some well-earned rest and relaxation. The perfect spot for downtime! Spa pool was lovely, and bed super comfy. The internet was fast. No complaints. Only suggestion is that they supply salt in winter in case of snowfall or ice. 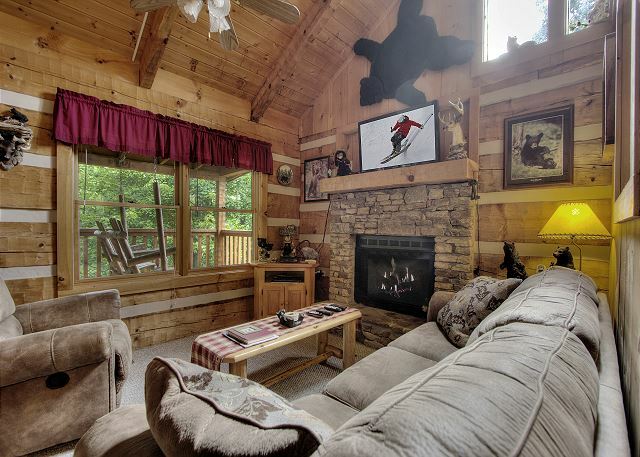 This cabin is a place for two people and a sofa-bed for two more if needed. 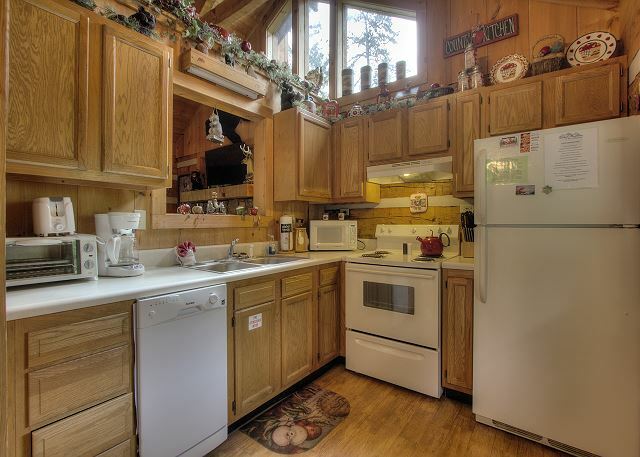 The kitchen had all the amenities and appliances you needed. The living room was huge and very picturesque and a nice large TV to relax to. THE LARGE BED inside the master bedroom was VERY SOFT and I didn't want to get up---loved it...not to mention the hot tub with jets inside. The balcony was scenic with a jacuzzi, bbq, and a 2-seat swing. And mother nature was below with animal sounds especially at night. For me, it was a place to get away from it all and not far down the hill are things to do and places to eat. Highly recommend this cabin...thanks for the vacation. We had an awesome experience. Friendly people and staff. We had such a great time in the cabin. It was very clean and had everything we needed for our stay. It had a beautiful view all around but the best view is from the cute porch swing on the back porch. We will be back in November! 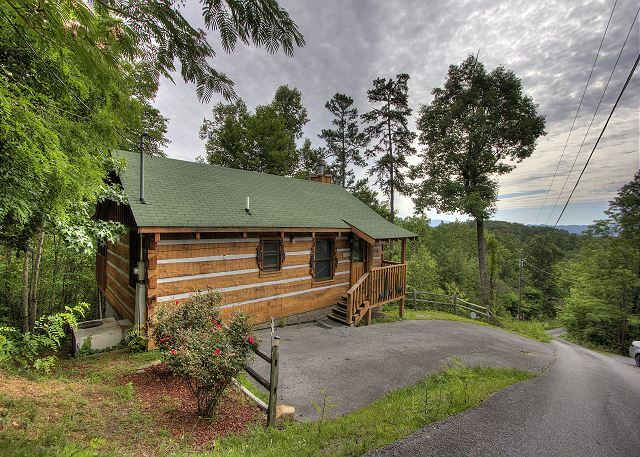 Apple Bear View is a very clean, and well maintained cabin; a great option for couples. The cabin is located close enough to town, but far enough away to give you that true mountain experience; the road to the cabin is a steep, so be prepared. During our week long stay, we enjoyed a drive through Cades Cove, and ate some really good food. Apple Barn, Dixie Stampede, and Big Daddy's Pizza were a few of our favorites. Check-in/Check-out was a breeze, and the staff of Aunt Bugs was quite helpful. Excellent small mountain cabin. Great location to get anywhere in the Pigeon Forge/Gatlinberg area...very clean with all the amenities for mountain creature comfort! AND what a view from the balcony porch swing. 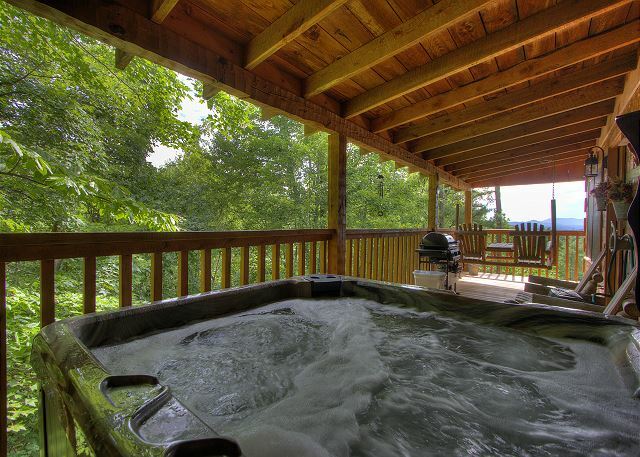 We spent hours looking at the mountains with coffee in hand.....(must bring mosquito repellant) Hot tub on the porch, jet tub in the bedroom (big enough for two)....We will be back many times....!! Our cabin was clean, very cute and a great view. I'd stay there again! The cabin was amazing! It was perfect for a couple getaway. It's so much privacy . I will be coming back with the family and most definitely for more couple getaways. Cabin was great Clean and very comfortable. We will be back. Cabin was great, as expected from pictures and description. Please include a warning regarding the steep hill and parking ( no turn around). My husband and I had a great time! The view was beautiful and so was the weather. We enjoyed sitting on the back deck and in the hot tub looking at the mountains. Everything was awesome. Only thing we really noticed bad was cobwebs on the ceiling and the bbq grill needed cleaned vey badly. Other than that, We loved our stay! We had a great time in the cabin, it was very relaxing, and the best bed we have had in all cabins that we have stayed. The only thing I would suggest is to make sure the housekeepers get all the cobwebs, and vacuum up the dead lady bugs in the corner behind the phone in living room. Other wise it was a perfect getaway for our Anniversary. The staff was friendly and even called to check on us :) Th cabin was nice with beautiful mountaintop views. Beautiful stay. Very clean. To many apple decorations. Needs to be more about nature. Love the decorations makes you feel at home . Please update directions to the cabin we had a hard time finding it . We would love to come back soon . Apple bear view cabin had an amazing view of the mountains! It was also very clean & comfy! Check in/check out was super fast, and the cabin was everything we wanted. We were close enough to the main part of town, but far enough out of town for that mountain experience. The cabin was clean, very well decorated. Loved the view from the back porch while swinging on the porch swing. We had an amazing time! We didn't get into town until after closing time but everything was already set up and very easy to do on our own! Everyone was very nice and helpful. 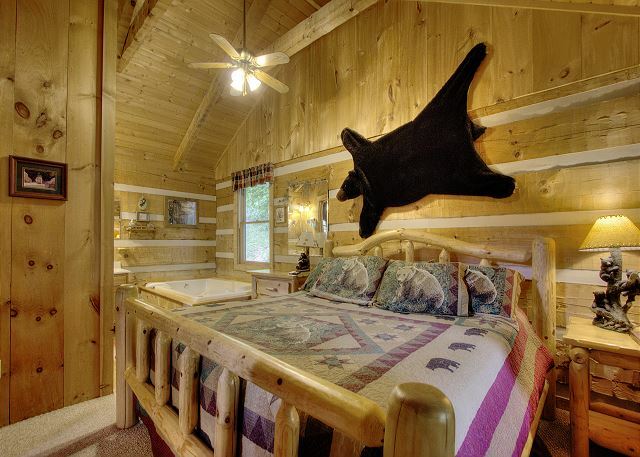 The cabin we stayed in was Apple Bear View and it was wonderful! Had everything we needed for our family! We will be back in November 2017!! !